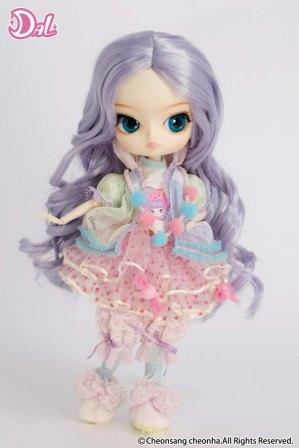 This lovely doll was released January 2012. Dal Dalcomi stands 9 inches tall. She has long, lavender curly spiral hair which flows pass her tiny knees. 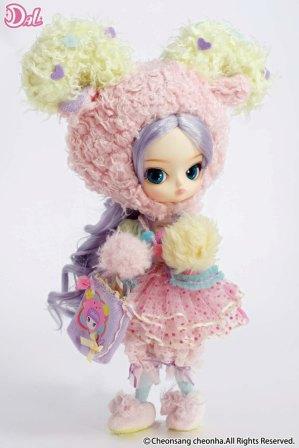 Go to eBay to own this cutie! She is wearing an ultra cute, frilly outfit. The skirt is made from the finest material of tulle and lace and sports a variety of pastel colors like lavender, cotton candy pink, baby blue. Covering her small legs are a pair of matching blue stockings which have hints of yellow throughout. One of my favorite things about this delightful outfit is the detail image in the center of her top. Look closely now, it’s an adorable image of our lovely model Dal. Oh, and did I forget to mention that she also resembles a sweet, soft and cuddly candy bear? That’s right. She is a darling bear fairy. 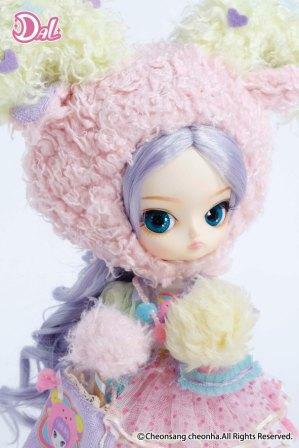 She has a plush pink and yellow bear cap which she can place on her head transforming herself from a cute, adorable girl to a cute, adorable bear. And on her feet are cozy matching slippers. Dalcomi’s favorite saying is: I'm going to dream about a lollipop with seven colors.....wrapped around extra sweet cotton candy!! Isn’t she just too sweet! Let’s give around of applause to our beautiful model Dal. Strut your stuff. You look beary, beary beautiful. Saying: I'm going to dream about a lollipop with seven colors.....wrapped around extra sweet cotton candy! !